The government's rejection of a plan to increase the number of women MPs is "startling", the chair of the women and equalities committee has said. 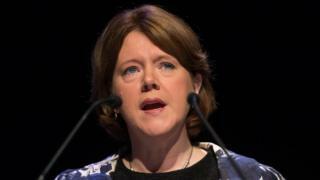 Maria Miller - a former Conservative cabinet minister - was speaking during a Westminster Hall debate on the issue. Her committee put forward six recommendations for government interventions - all were rejected. The government said political parties have "primary responsibility" for improving representation. The committee set out its recommendations in a report published in January. The government's response, published in September, rejected all the recommendations. The government agreed increasing women's representation was "an important issue" but it said political parties "have primary responsibility for ensuring that women come forward to represent them and are put in positions from which they can win seat". Ms Miller's committee agreed political parties had "primary responsibility" in this area but also called on government to do more. MPs said the "culture" of Westminster was putting women off politics. Tulip Siddiq, Labour MP for Hampstead and Kilburn, said late-night votes were a barrier for young mothers while other members "barking like dogs at women while they speak in debates" was deterring women from standing as MPs. Jess Phillips, Labour MP for Birmingham Yardley, said all-women shortlists were "the single biggest reason for progress" in representation in Parliament. All-women shortlists were adopted by Labour in the run-up to the 1997 General Election. In 2016 the Liberal Democrats also voted to adopt them in some seats, while the SNP did the same in 2015. The 2017 general election saw a record number of women elected to parliament but there was significant variation between parties - 45% of Labour MPs are women but only 21% of Conservatives MPs are. The government said it did not believe legislation was the right approach and it would not be appropriate to "dictate" what parties should do. It said parties were in the best position select women candidates with "the best possible chance of election". Responding to the debate on behalf of the government, Cabinet Office Minister Caroline Nokes said the equalities office was commissioning a review of approaches to increase women's representation to provide parties with a range of possible solutions to draw on.